I lived in the city long enough to go through one winter, and in that short time I learned there is just something you seriously cannot do without. Good boots. Chances are, here in the Second City area, you won’t really have to be climbing through large mounds of snow — more like the banks created by the plows that decide that sidewalks really don’t need easy access points… Or in the neighborhoods where people just refuse to get out and do their civic due of shoveling their sidewalks. However, boots are a must. Since it’s already hit the 30s, and with the wind and everything it feels like the 20s… students across campus have already started donning their winter wears. Well, not so much as in coats and such, but the boots are out in mass. And there’s one boot fashion trend that seems to not want to die. They hit the peak of their popularity in the early 2000s. Anyone who was anyone had on these boots, pants tucked in, so everyone could see that you were indeed stylish. A very popular outfit with these were sweatpants. It was the “I just got out of bed” look… and seriously, who wouldn’t want to wear the most comfortable and warmest clothes they could in the winter? I, however, refused to buy Uggs. Not just because I was bucking a trend, but because frankly I thought they looked dumb. 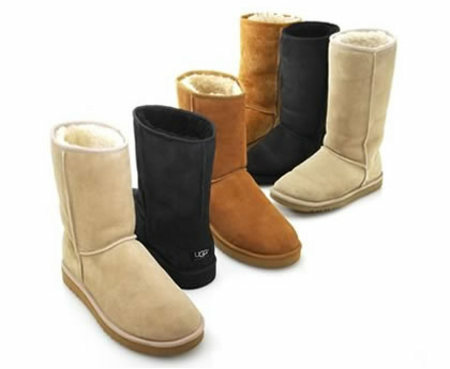 Best of all with the Uggs… the Fluff Momma. 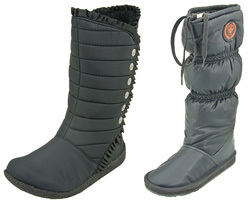 I kid you not, that’s the official product name of these horrific sasquatch feet of boots. Yes, make me look like a giant snow beast. It’s exactly what I want. I find these boots to be absolutely hilarious. Maybe if you live somewhere that it doesn’t snow much, or they don’t use salt or sand on the roads, leaving dirty slush everywhere… maybe then could these boots survive past one winter. The idea of washing one of these after a romp around the city seems beyond what most people would ever want to do. Granted, they do look warm though. The boots that strike my fancy are from Blowfish and Rocketdog — two companies which happen to be related. 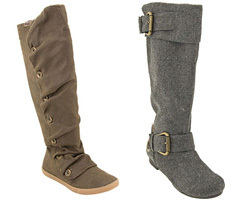 Both brands have produced shoes and boots in the past that I’ve been oh-so tempted to purchase, and sometimes I question why I haven’t yet. I wouldn’t wear the Hobbit boots around this winter, not once it starts to snow. I’m not even sure I’d do the same with the Hey Nows, but it just depends on how water proof I could make them with various sprays. The boot on the right, the Faldo, is a flannel boot… Again, as long as I could keep it dry (or at least my socks) then I might consider these. For something a bit more waterproof, and well a better twist on the classic snow boot, I’d probably want the rocketdog popcorn boot (shown on the right) or the honeydew (on the left) — both of which, by the way, are vegan. These boots would definitely survive various jaunts around the city, slush and all. And well, apparently the only way to wear boots now is to tuck in whatever sort of pants you have on. This would be the only reason I’d probably ever get skinny jeans (with hips like mine, I don’t really need to accent them). Granted, I don’t tend to wear my boots around the office… Anyway. Tucking in, though it used to be something I’d thought was sort of silly, is very practical. I tend to be quite fond of dry pants, so keeping them out of the muck is key. Last winter I was surprised more than once by the depth of a snow patch or slushy puddle. This year I’m actually looking for a new pair of boots. And though I’m leaning towards something faux fur lined, I’ll be passing on the Uggs (though an old high school friend swears by them). Knowing me, I’ll end up buying two pairs… this has definitely been a year for shoe buying for me. What can I say, I like footwear.